Any modder out there willing to convert the following model to two buildings? It is in 3ds format. Warehouse (with a stocker profession) not accessible to other bannies. 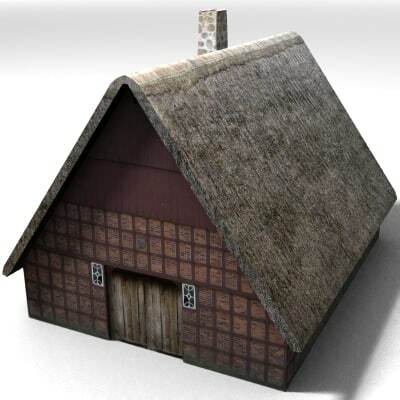 Replace the thatched roof with wood shingles. Only one door (middle 2 tiles width). Keep the chimney. 6x8 size without road tiles. 80 000 storage capacity. All flags. 3 workers max. 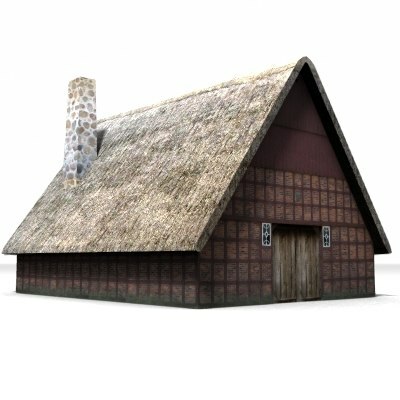 Barn for edibles, tools, clothing, textiles and herbs. Replace the thatched roof with wood shingles. Only one door (middle 2 tiles width). Remove the chimney. 6x8 size without road tiles. 80 000 storage capacity. I like this idea a lot. Wondering, would there be a way to have a 'warehouse' style stockyard with stockers also? Theoretically, yes. I don't think the game has anything against a stock yard but I am not sure it can have free size. Just letting everyone reading this topic to know that @Discrepancy has kindly created the requested mod.